1. Grand Commander of the Legion of Merit (G.C.L.M.) - for outstanding service to Rhodesia. A gold star on silver with 8 emeralds set around a Zimbabwe bird. 2. Grand Commander of the Legion of Merit (G.C.L.M.) (Military Division) - for outstanding service to Rhodesia. The cross is gold on silver. 3. Grand Officer of the Legion of Merit (G.L.M.) - for outstanding service to Rhodesia. A silver star. 4. Grand Officer of the Legion of Merit (G.L.M.) (Military Division) - for outstanding service to Rhodesia. A gold on silver cross. 5. Independence Decoration (I.D.) - for persons who played a notable and significant part before or at the time of, or immediately succeeding the Declaration of Independence. A silver medal. 6. Independence Commemorative Decoration (I.C.D.) - for persons who have rendered valuable service to Rhodesia up to 2nd March 1970. A bronze medal. 7. Commander of the Legion of Merit (C.L.M.) - for distinguished service to Rhodesia. A gold on silver cross. 8. Commander of the Legion of Merit (C.L.M.) (Military Division) - for distinguished service to Rhodesia. A gold on silver cross. (A red rosette for combatant service). 9. Officer of the Legion of Merit (O.L.M.) - for distinguished service to Rhodesia. A gold on silver cross. 10. Officer of the Legion of Merit (O.L.M.) (Military Division) - for distinguished service to Rhodesia. A gold on silver cross. (A silver rosette for combatant service). 11. Member of the Legion of Merit (M.L.M.) - for distinguished service to Rhodesia. A silver on bronze cross. 12. Member of the Legion of Merit (M.L.M.) - for distinguished service to Rhodesia. A silver on bronze cross. 13. Police Cross for Distinguished Service (P.C.D.) - for distinguished service. A gold on silver cross. 14. Defense Cross for Distinguished Service (P.S.C.) - for distinguished service. A silver cross. 15. Prison Cross for Distinguished Service (P.S.C.) - for distinguished service. A silver cross. 16. Medal for Meritorious Service (M.S.M.) (Civil Division) - for resource and devotion to duty or exemplary voluntary service to the community. A silver medal. 17. Medal for Meritorious Service (M.S.M.) (Military Division) - for resource and devotion to duty. Used only for territorial, volunteer and reserve forces. A silver medal. 18. Police Medal for Meritorious Service (P.M.M.) - for meritorious service. A silver medal. 19. Defense Force's Medal for Meritorious Service (D.M.M.) - for meritorious service. A silver medal. 20. Prison Medal for Meritorious Service (P.M.S.) - for meritorious service. A silver medal. 21. Presidents Medal for Chiefs - for chiefs who have rendered conspicuous service in the interest of their people. A silver medal. 22. Presidents Medal for Headmen - for headmen who have rendered conspicuous service to their communities over and above the call of duty. A bronze medal. 23. Rhodesia Badge of Honor - for long service and devotion to duty in Government, Municipal or Private Service. A bronze medal. 24. Grand Cross of valor (G.C.V.) - for conspicuous valor by members of the security forces in combat. This is the highest award for gallantry and as such will head the order of precedence. a 9ct gold medal. 25. Conspicuous Gallantry Decoration (C.G.D.) - for acts of the highest gallantry and brave conduct of an outstanding order in a non-combatant capacity. This award may be made to civilians and members of the Security Forces and as the second highest award for gallantry, will rank next to the Grand Cross of Valor in the order of precedence. A silver medal with gold inlay. 26. Police Cross for Conspicuous Gallantry (P.C.G.) - for conspicuous gallantry. A gold on silver cross. 27. Silver Cross of Rhodesia (S.C.R.) - for conspicuous gallantry. A silver cross. 28.Prison Cross for Gallantry (R.P.C.) - for conspicuous gallantry. A silver cross. 29. Police Decoration for Gallantry (P.D.G.) - for gallantry. A Silver medal. 30. Bronze Cross of Rhodesia (B.C.R.) (Army) - for gallantry. A bronze cross. 31. Bronze Cross of Rhodesia (B.C.R.) (Air Force) - for gallantry. A bronze cross. 32. Bronze Cross of Rhodesia (B.C.R.) (Guard Force) - for gallantry. A bronze cross. 33. Meritorious Conduct Medal (M.C.M.) - for brave and gallant conduct over and above the call of duty in a non-combatant capacity. This award may be made to both civilians and members of the Security Forces. A bronze medal. 34. 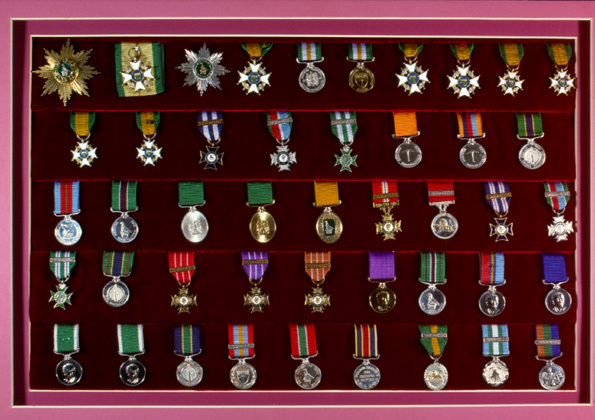 Prison Medal for Gallantry (R.P.M.) - for gallantry. A silver medal. 35. Rhodesia General Service Medal (R.G.S.M.) - for service on operations undertaken for the purpose of combating terrorists or enemy incursions into Rhodesia. A cupro-nickel medal. 36. District Service Medal (D.S.M.) (Internal Affairs) - for service on operations undertaken for the purpose of combating terrorists or enemy incursions into Rhodesia. A cupro-nickel medal. 38. Prison General Service Medal For the part played in maintaining law and order, subsequent to 1968. A cupro-nickel medal. 39. Police Long Service Medal (P.L.S.M.) - for long service. A silver medal. 40. Exemplary Service Medal - for long and exemplary service. A silver medal. 41. Prison Long Service Medal - for long and exemplary service. A silver medal. 42. Police Reserve Long Service Medal - for nine years service in the "A" reserve or 15 years' service in the Field Reserve. A silver medal. 43. Medal for Territorial or Reserve Service - for 12 years service in the Territorial, Volunteer and Reserve Forces. A silver plated medal. 44. Fire Brigade Long Service and Good Conduct Medal - for long service in a fire brigade. A silver medal. 45. President's Medal for Shooting - awarded to the champion shot of the Security Forces. NOT ILLUSTRATED - Military Forces Commendation - a silver or bronze pick emblem that denotes an act of bravery, distinguished service, or continuous devotion to duty in the operational area or non-operational sphere. This emblem will be displayed either on the ribbon of the appropriate General Service or campaign medal.